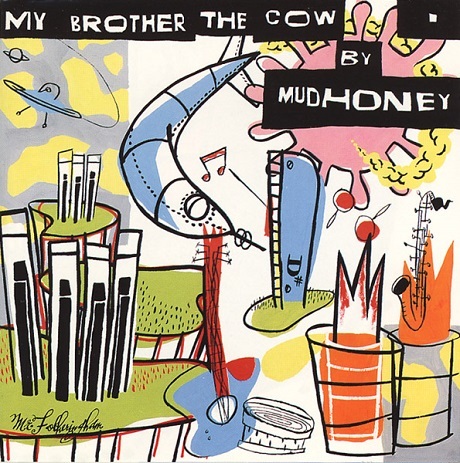 Though they showed us their Vanishing Point in 2013, Mudhoney are now ready to have their 1995 LP My Brother the Cow re-materialize on vinyl for the first time in years. Originally released through Reprise in the mid-'90s, the upcoming edition comes out August 11 via Music on Vinyl, Modern Vinyl points out. Though a deluxe CD reissue arrived in 2003, this is the first new pressing of the album since its original release. It comes on 180 gram vinyl, with the limited pressing of 1,000 copies appearing on white vinyl. The 12-song LP was recorded with producer Jack Endino (Gas Huffer, Tad, Supersuckers), with a press release explaining that the song cycle had the band serving up sly nods to their influences. For instance, Bad Brains' "Fearless Vampire Killers" was referenced with "F.D.K (Fearless Doctor Killers)," Captain Beefheart's "Orange Claw Hammer" got a nod via "Orange Ball-Peen Hammer" and a few Led Zeppelin lyrics were sneaked onto "1995." In addition to the LP, the repress comes packaged with a bonus 7-inch featuring six more era-appropriate tunes. You'll find the tracklisting info and the music video for blues-damaged album opener "Judgment, Rage, Retribution And Thyme" down below. 3. What Moves The Heart?